An Elk Grove domestic violence victim and a one year old baby were able to escape after being held against their will yesterday. The alleged domestic violence incident started on Monday when the victim was allegedly beaten by 22-year old Alexander Anthony Moreno (pictured above). When the victim attempted to leave the apartment, Moreno dragged the victim by the shoulders down a hallway back into the apartment. While the victim was attempting to escape, Moreno left infant child unattended on a second story balcony. On Tuesday morning, the victim was about to exit the apartment and sought the help of a stranger who contacted Elk Grove Police. 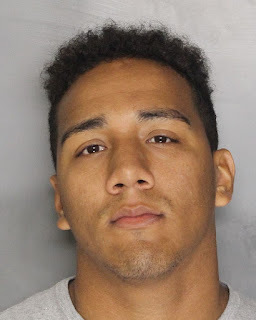 Responding officers arrested Moreno who is being held at the county jail on a $1 million dollar bail and faces felony child endangerment, kidnapping, domestic violence and violation of probation charges. Arraignment is scheduled for Thursday afternoon. The victim suffered visible injuries as a result of the beating and was granted an emergency protection order.